Data from the company CARFAX shows New Jersey leads the nation with the most formerly wrecked vehicles masquerading as problem-free, which may be part of a scheme to artificially inflate resale value for cars that would otherwise be considered damaged goods. After major accidents or floods, damaged vehicles are supposed to be labeled with a "salvage" or "junk" title, but CARFAX found more than 77,000 instances in New Jersey where salvage or junk titles turned into clean titles after sales. Such cases are red flags for investigators; they may indicate a scam known as "title washing," whereby individuals and dealers alter vehicle ownership documents to remove salvage or junk brands. Doing so can dramatically increase a vehicle's resale value. "They’re cleaning these cars up cosmetically just enough to where it passes your eye test. And they’re selling that car to you, putting it on the road to where it’s endangering not only your life but potentially other people on the road," said Chris Basso, a CARFAX spokesman. To compile the list of states with the most title washing red flags, CARFAX analysts scoured their database and counted every instance where a junk or salvage title was changed to a clean slate. After New Jersey, North Carolina, Mississippi, California and Georgia round out the top five states with the most switched titles. The data is cumulative and goes back decades, so many of the vehicles are no longer on the road. See the complete list of title washing red flags by state below. 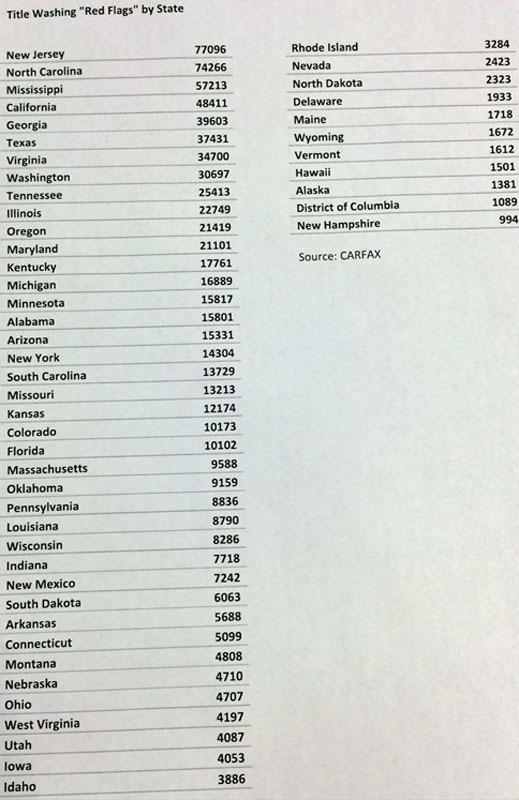 Though one might expect more title washing to occur in states with more vehicles, the CARFAX numbers do not bear that out. For example, New York state had about 10.4 million vehicle registrations on file in 2014. That’s far more than New Jersey, which had less than 7.9 million vehicle registrations. Despite New Jersey having millions fewer cars and trucks, the Garden State had five times more title washing red flags, the CARFAX analysis showed. To estimate where many of the formerly damaged vehicles might be lurking on New Jersey roads, the I-Team analyzed CARFAX data to make this map. The map shows how many rebuilt wrecks have been registered to each New Jersey town. The municipality with the highest concentration of title washing red flags has historically been Merchantville, New Jersey -- a borough of fewer than 4,000 people. CARFAX found 759 vehicles that show signs of title washing registered in Merchantville. That equates to about one rebuilt wreck for every five people in town. Chuck Riley is a Merchantville-area lawyer who represents auto fraud victims. He speculated Merchantville may be home to someone who buys junked cars and sells them to dealers. "Somebody is seeing an opportunity here," Riley said. "Somebody that is involved in the car business and maybe has a dealership nearby is running these scams or they have a straw man who is involved in doing these purchases." Riley also suggested vehicles damaged by Sandy's floods several years ago may account for many of the cars and trucks that have title washing red flags in New Jersey. To get to the bottom of the Merchantville mystery, the I-Team sent the Motor Vehicle Commission VIN numbers from vehicles that exhibit signs of title washing. The agency is investigating. "We are looking into this matter as we did in 2012 with the New Jersey Attorney General’s Office after Superstorm Sandy," wrote Mairin Bellack, a spokeswoman for the agency. "The New Jersey Motor Vehicle Commission is committed to protecting our residents and our roadways," Bellack added. Whatever the reason for all the rebuilt wrecks on New Jersey roads, consumer advocates say the best way to avoid buying one is to demand a vehicle history report from the dealer. Dino Aspromatis says he wishes he had done that. Three years ago, Aspromatis bought a shiny new Volkswagen. It wasn't until later that he learned it had been a salvage car. Someone cleaned the title -- and now he's worried the re-sale value will plunge. "I can't really sell it on an open market as a clean title because it's tarnished by having a salvage title at some point," said Aspromatis.